see, to set free, my tunes, iTunes, oh it’s such A Beautiful Life. 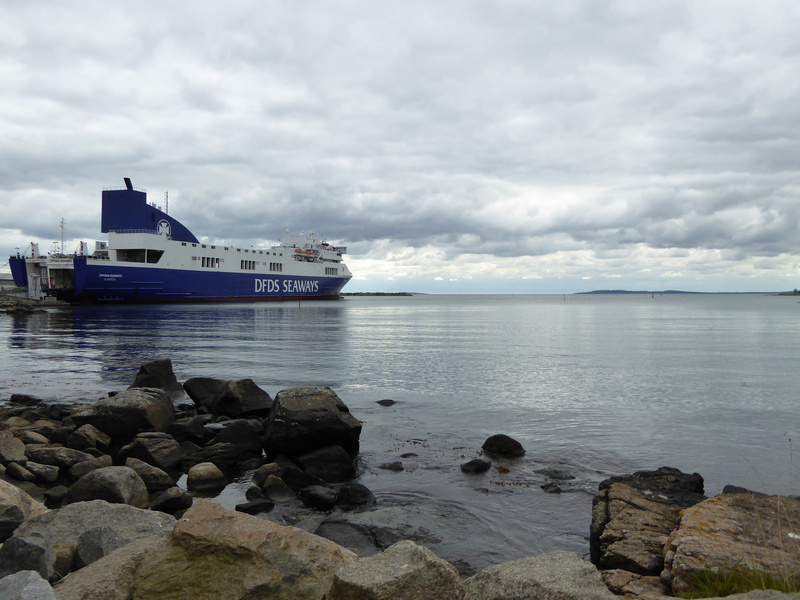 For more photos from our cycle tour of Germany, Denmark and Sweden click here. and send it back to where it belongs. The Union was and is British. of red, white and blue. and leave our flag alone. 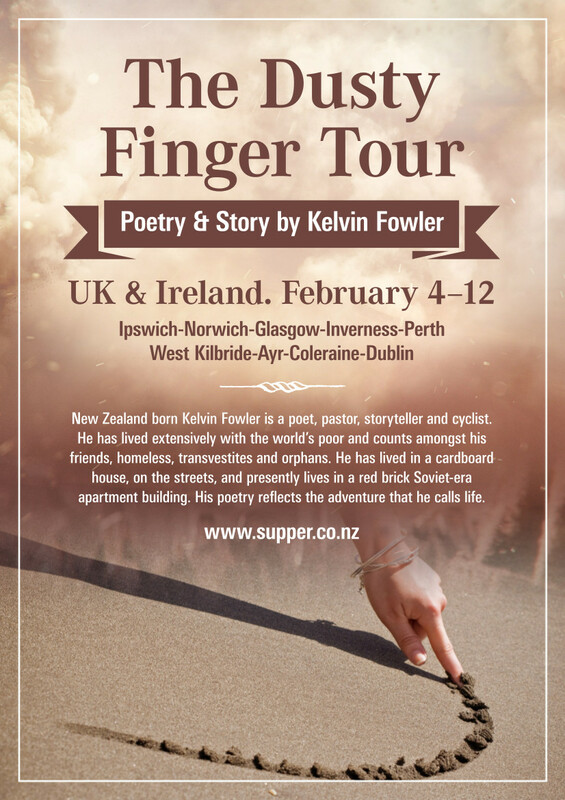 I think I what will remember most about this tour will be my cold, shingles and the late nights. It was wonderful to do another tour in English and a first language. I started in a very cool pub venue in Ipswich with a very small turnout and an audience who enjoyed politics. The next morning greeted me with a pub breakfast and peaceful train trip north to Norwich. The small afternoon youth gig in Norwich was a delightful challenge and well worth the effort. The evening gig was exceeding well planned, resulting in a packed venue and enthusiastic crowd. This was definitely my best ever English gig. After breakfast my host drove me to ‘holding-pen’ Stansted where I flew north. After a lovely afternoon dog-walk I played to the home-crowd of Glasgow. 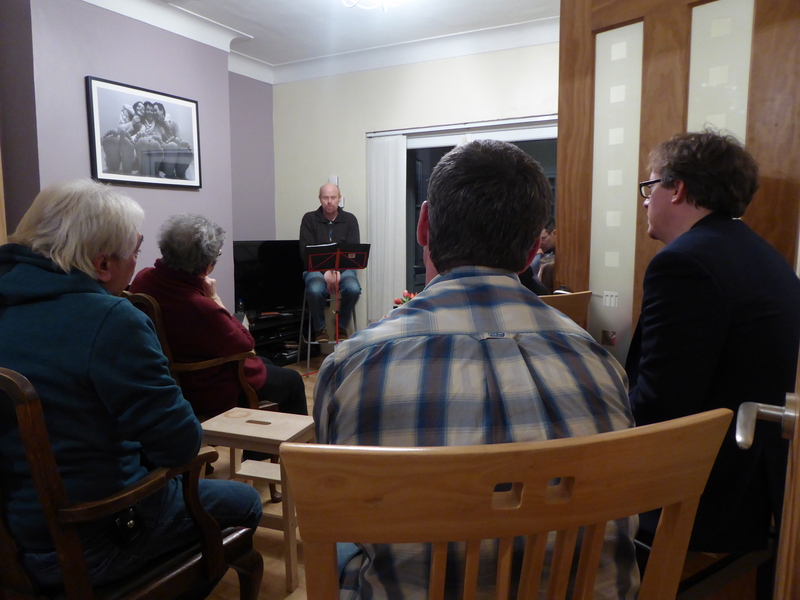 It was a house gig with friends where I dragged out my faithful Scottish poetry. The morn greeted me with good coffee and two northern train trips to a small village south of Perth. 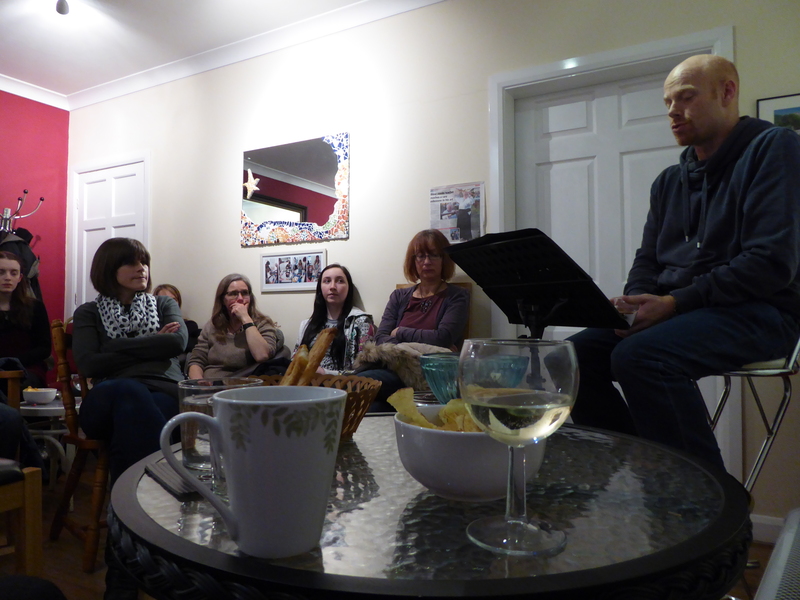 This was a lovely afternoon open-fire house gig. The last of my northern journeys was a snow laden train excursion to Inverness. After lunch I was blessed with a quick trip monster hunting at Loch Ness. 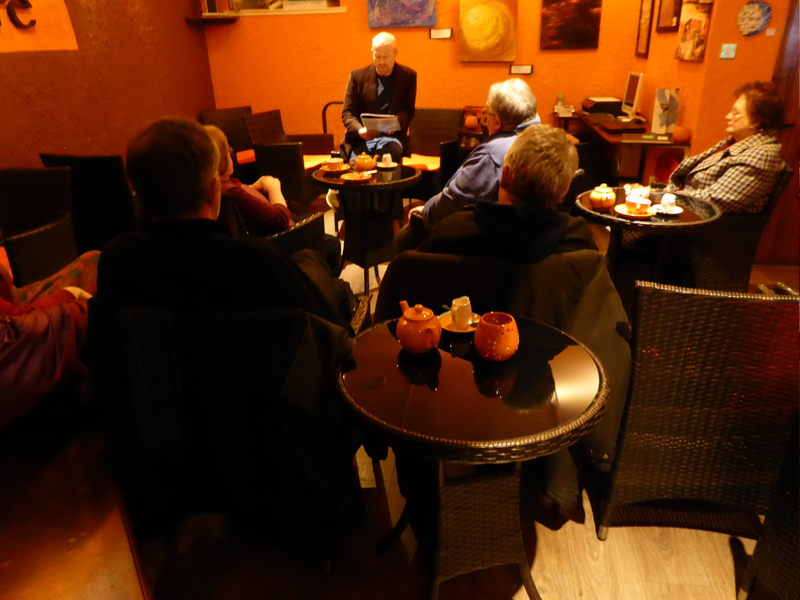 The evening was spent with a warm audience in the Sunset Cafe. My journey south was absorbed by a delayed train and a very drunk Highlander mourning his dead cat. 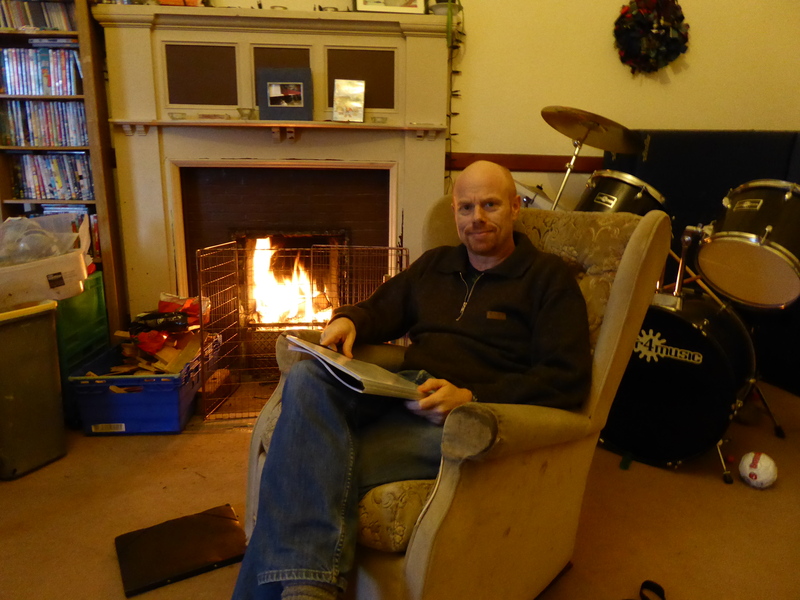 The evening in West Kilbride was spent reading around a candle-lit table flanked by a roaring fire. After a very late night I was driven to Ayr where I managed a morning snooze and a spot of shopping before performing in front of a very responsive crowd in a very packed Su Casa cafe. By the morning I was quite sick and shared this with a plane load of people flying to Derry city. It was a lovely Northern Irish day worth the coastal road to Coleraine. I shared the evening in Kiwi’s Brew Bar with excellent musicians. Unfortunately my fuzzy-head-cold left my performance a bit flat. More snow on the morning’s drive to Belfast. Lovely train as I headed south. 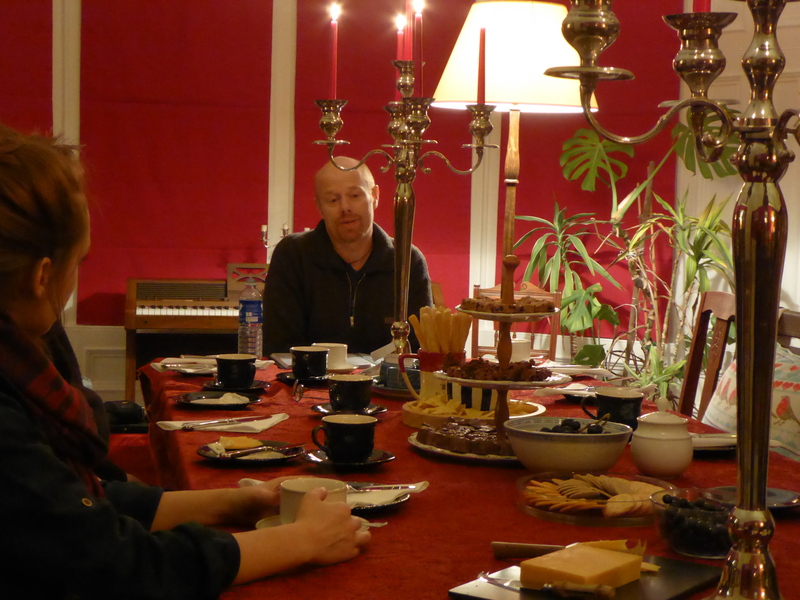 Dublin the final event was a house gig with a fun loving crowd. 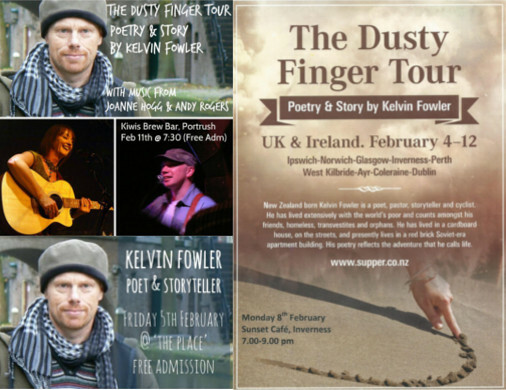 The Dusty Finger Tour finished just before midnight. 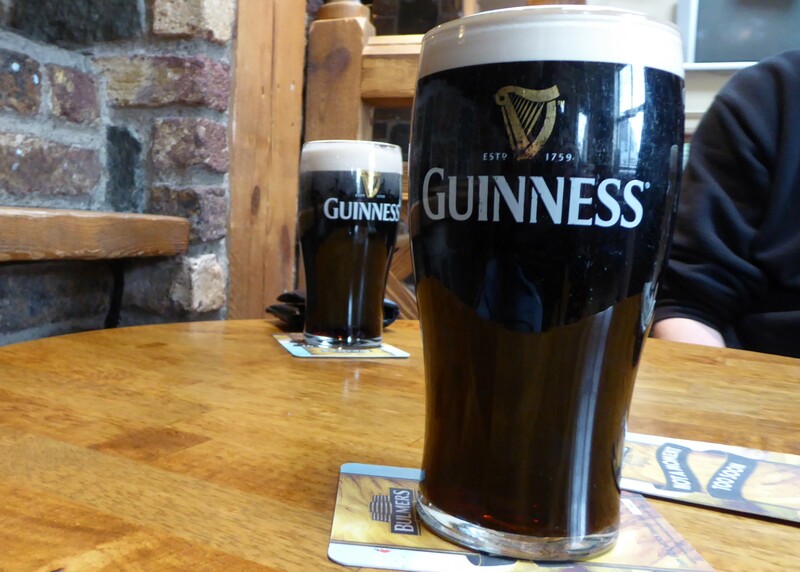 I had a good long sleep before an Ulster Fry, walk through the village and celebratory Guinness. I think what struck me the most on this tour was the quality of the audiences. I met so so many good people. Thanks so much to my hosts who did a such a good job or organising things. Once again we woke to a dew-covered tent and cool wet grass. We have a very good Macpac Mineret tent, but for some reason my sleeping bag had been getting wet. So once again a clothes-line was strung and my down-bag hung. We were quick to empty the tent and move it pitched into the sun. We sat watching the morning mist rise from farrowed fields and lazily enjoyed our porridge. We started our ride waking up with cows alongside a sleepy Kubitzer Bodden. There were dog walkers out and as per usual I quietly tinkled my bell a few metres behind them as a warning that two idiot cyclists were about to pass. As per usal this kind gesture was greeted with condemnatory glares. The other option is that we silently ride past. Usually the result of this is a horrifically frightened pooch walker clearly not expecting random Kiwis on quiet bikes to be intruding on their territory. Passing isolated walkers and ringing or not ringing our bell is always a damned-if-you-do and damned-if-you-don’t situation. The danger is, when startled they tend to jump in front of us. Heading towards Rambin, over our left shoulder was the E22 and main road to the island’s capital city of Bergen. There was clearly a traffic jam on the E22: this made us even happier to be quietly zooming our way along quiet back-roads in search of breakfast. With no warning we turned a corner into bumper to bumper traffic. It was horrible. Trucks and cars that couldn’t really fit on the road in their effort to avoid the traffic jam were all competing for space on a road barely wide enough for two cyclists. Quite relieved we arrived in Drammendorf and turned out of the traffic. Here we stumbled across two elder men pottering over their car. I asked for directions on how to find a shop. In an effort to draw a map they promptly produced a piece of cardboard. With considerable pride one of the men said, ‘we are German, we do maps’. Then he started to leave looking for a pen. Reaching for the pen in my bar-bag I called him back and said, ‘we are Kiwis, we come prepared’. The gentleman smiled at me, my attempt at humour did not make it over the language or cultural barrier. We enjoyed the encounter and followed his scribbled German precision flawlessly to the shop. The shop was pleasantly weird. Sharon went in and purchased our morning yoghurt and I stayed with the bikes and surveyed the craft that was on sale. 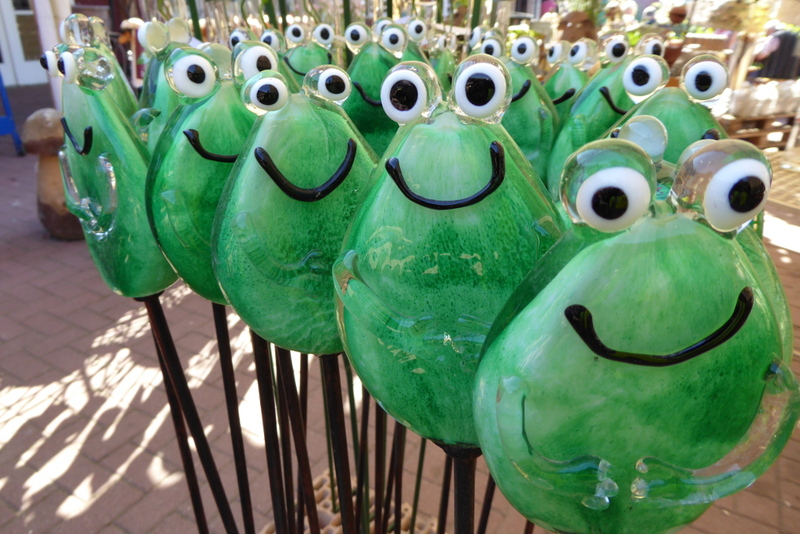 They had a variety of glass frogs and tin birds, each supporting huge smiles. Scanning the small crowd of mulling people I could not see a smile anywhere; in fact I am unsure I saw a smile on the whole island, but yet all this craft was grinning ear to ear. As only freedom campers can do, we frightened the locals and made good use of their well vented toilets, then endured their scorn filling our water bottles in their hand-basin. Leaving, we cycled back into the village and found a table, dried our clothes and enjoyed our second breakfast. Two older woman walked past, gave us lovely smiles and seemed genuinely happy to see us sitting in front of their church using their table. I wonder if it was these people who made the glass frogs and tin birds. 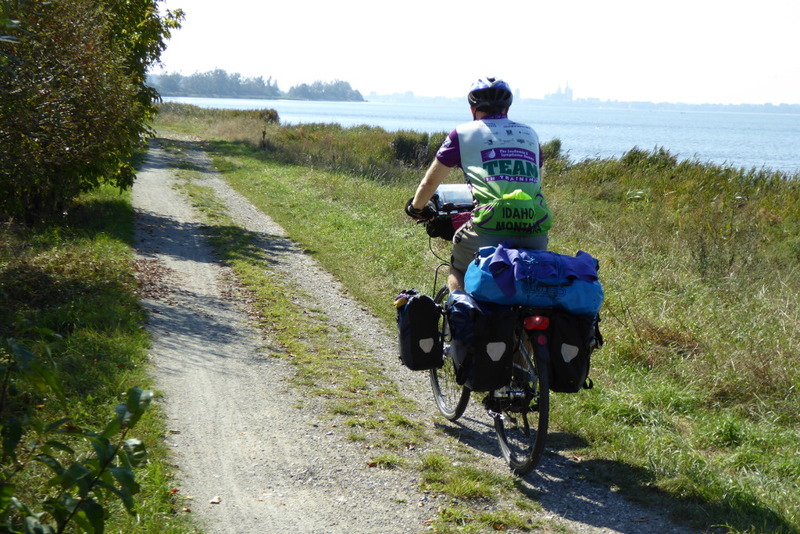 Venturing out into the wind we followed the bodden along a collection of quiet roads, gravel track and bumping cycle paths. Once again on flat ground I was alarmed at how slow Sharon was cycling. Stopping for morning tea in the bustling ferry port of Altefähr. We sat outside in the sun with a plate of fries and another bad coffee we reflected on our island adventure and mourned a little that our time in this cute wee village was so short. The village’s exit was a steep cobble stone street, a ride through houses along a ridge before popping out beside the highway where this journey had started. Officially we had circumnavigated the island. It had been quite the adventure and a lot of fun. We had experimented with free-camping for the first time, survived to tell the story and really enjoyed it. But this wasn’t the end of the story: starting with a rather large bridge, we still had a day and a half to ride. On our first night we had camped near the Rügendamm bridge and now it was time to cross it I was very excited. I passed my camera to Sharon and off I set into a quiet sea of ‘texting’ cyclists plus fishermen. 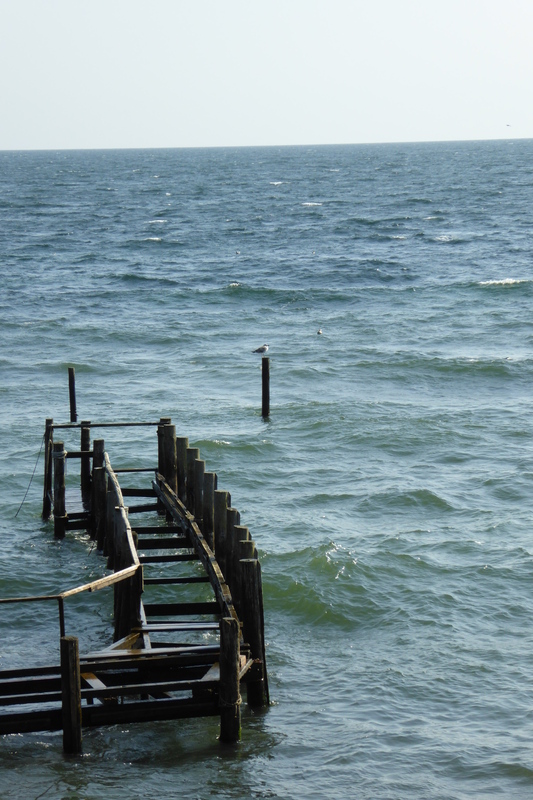 At one stage I even stopped to help a man get his fishing gear across a fence. Unfortunately the end of the bridge symbolised for us the start of the largest city we have ever cycled through. Fortunately it was a lazy early Saturday afternoon and my printed Google maps were quite detailed. 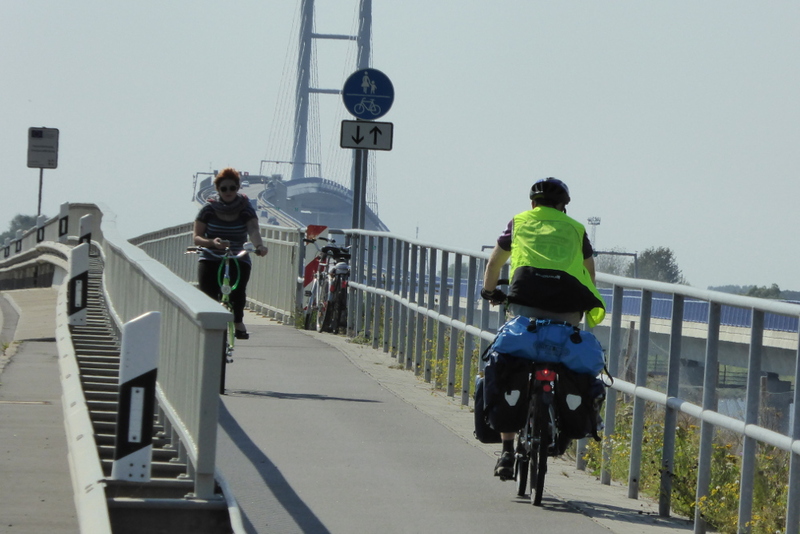 Living in Lithuania we have learned to fear following cycle paths across roads. Sharon managed to seemingly upset the majority of the city’s motorists with giving way to cars when she had the right-of-way. As is our daily routine, we stopped at a supermarket, Sharon dashed in, I sat at a table in a bakery and guarded our stuff. Our experience of Straslund was of good motorists, simple cycle-tracks, rude, rude people and an irritatingly noisy cannon. That’s really all I want to say about Straslund; a pretty city that will not get a return visit in a hurry. By the time we got to Kramerhof we were enjoying ourselves again. We gave directions to a lost couple somewhere near Grob Damitz. I love giving directions to people when neither of us speak the same language. Hand signals and smiles can go a long way towards world peace. Shortly after, we ourselves got lost at some kind of military base in Klein Damitz and then stumbled upon a picnic table beside Prohner Wiek. We were a little tired and took this opportunity overlooking the water to stop and cook our noodle and pesto lunch. Although it was an unlikely fusion of food, Malaysia meets Italy was perfect for this sunny day. Slightly panicking I rode out of town. A few kilometres up the road I stopped a couple of tour-cyclists and asked where they had come from and where they were going and if they had seen my loving lost wife. They hadn’t, but agreed to pass on a message if they met her. I cycled on to Kuhle, turned around and cycled the 4.3 kilometres back to Dranske without seeing her. I asked again at the shop and we decided that I would return to the roadworks one last time before calling the police. 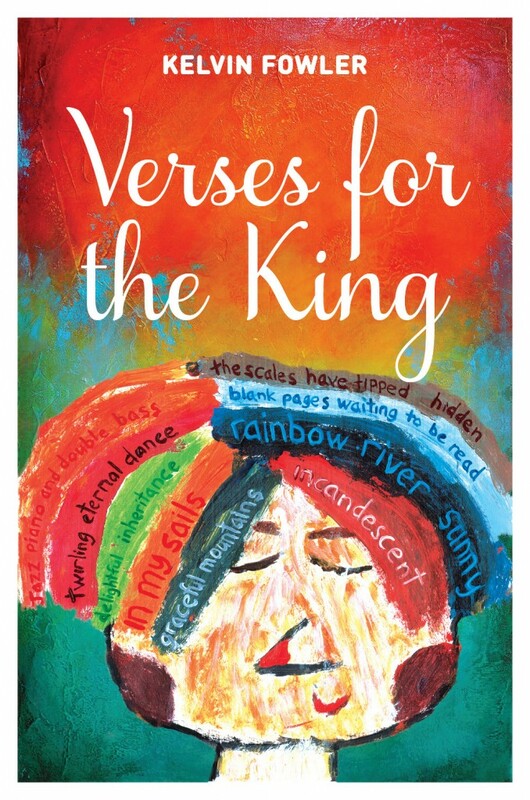 As I approached the roadworks, the silence was uncharacteristically broken by the sound of voices. 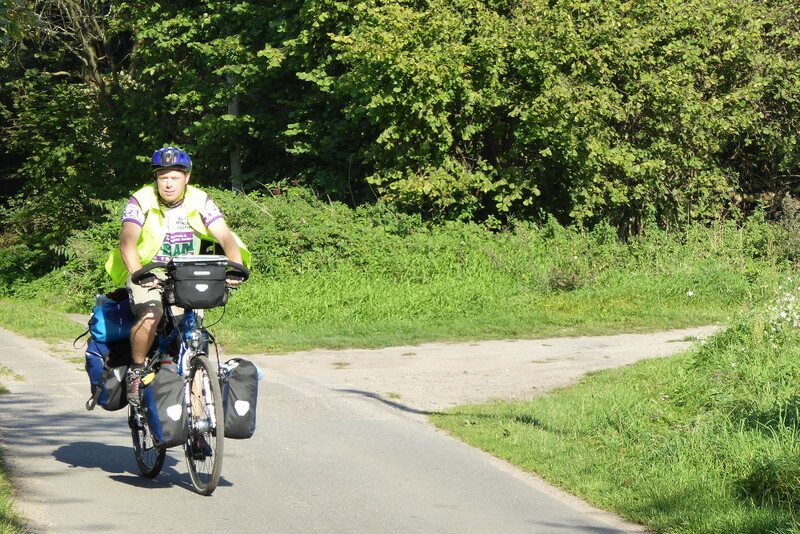 I spied the previously encountered tour-cyclists and following them chuntering away was my precious missing bride. We were both relieved and befuddled. The couple who had passed on my message were leading Sharon to the outsides of town. I had asked them to direct her to the shop in the town centre and then set her off cycling toward Kuhle and I would meet her on my way back. When I bumped into them they were escorting Sharon around the outskirts of the village. If I had been a minute later I would have totally missed her. Sharon’s side of the story was that when she reached the town, she wisely waited at the entrance because this was the last place she had sighted me. She was quite concerned about how long it was taking me to return to her, but was seemingly content to read her book until being rescued by our new tour-cyclist friends. 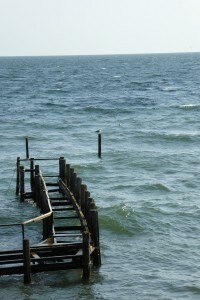 I am not sure how many lessons we learnt from this experience, but am glad we learnt them in such hospitable territory. Hungry, we cycled to the shop and thanked them for their concern before riding out to the village supermarket. Again I couldn’t help but notice that on such good cycle paths Sharon was travelling uncharacteristically slow. We found a wee gazebo just off the bike path, stopped and cooked a very very late lunch . We flew through Kuhle. 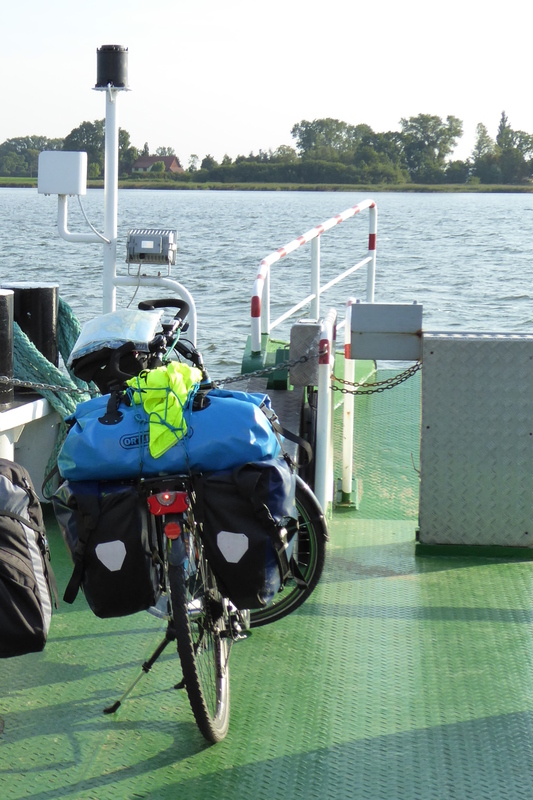 Following the lagoon south, we passed Wiek and rode fun cycle tracks all the way to the Wittower Ferry. We stopped there for breakfast – yes, breakfast. Our day was so muddled we had yet to eat our breakfast rations and had no idea where or when supper would be. We turned west again and travelled rough concrete-block roads indicative of a communist past. Eventually we ambled our way into the very picturesque village of Schaprode. We stumbled across public toilets and since our water bottles were empty, decided to pay and both empty and refill our systems. It was late in the day and the woman serving us wanted to get home. She was visibly angry at me for filling my water bottles and was murmuring all sorts of German words I am sure I could not repeat. This quiet sour barrage only increased when I opened the toilet door and asked Sharon to pass me her bottles. Regretting that we did not have more time and aware of the fading light, we continued riding. It turned out a ferry had just docked and seemingly millions of people needed to be driving down the same narrow road as us. In any other country this would have been a horrific problem, but not here in Germany; these people know how to respect road users of the cycling variety. Because of time and light, we had decided to take a shortcut and follow busier roads into Trent. In Trent we stopped in a rather posh outdoor restaurant for a healthy Coke and pee. By now we were riding with lights on and appreciating our excellent Endura high-visibility gilets. We hurriedly rushed the next five kilometre stretch of main road. Again even when Sharon was trying to rush, for her she was annoyingly slow. Somewhere at the back of my brain this was beginning to concern me. We turned right and followed a lovely quiet road into the night and into Gingst. It was a warm evening; people were sitting in outdoor restaurants, silently enjoying their evening meals. We set out to find a guest-house. After encountering some helpful people, we concluded the town was either booked out or ridiculously out of our price range. By now it was dark. 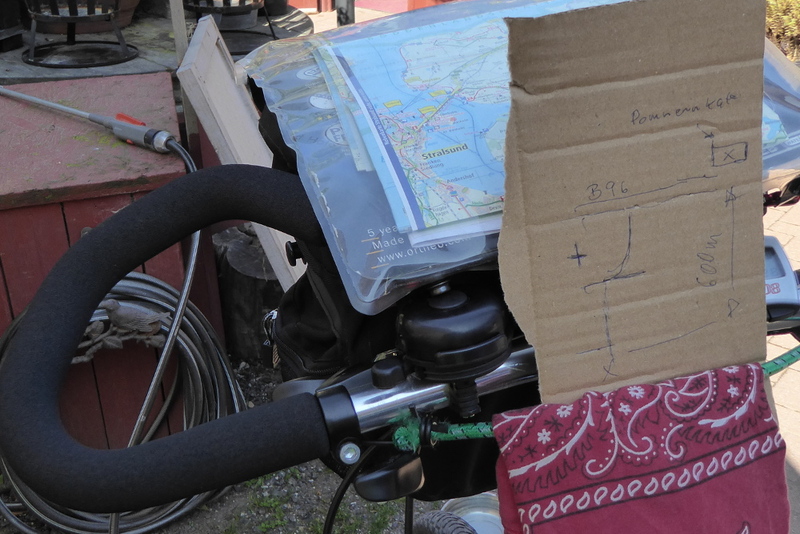 I was riding with one hand on the handlebars and the other shining Sharon’s torch on my map. We had decided to navigate another shortcut until we found a quiet place to pitch our tent. We hung a left and set out through the night across a narrow concrete track through a farmer’s field. This was not a problem for me; I have a dynamo in my front hub that provides excellent light. On the other hand, Sharon had to be considerably braver. Her battery powered flickering front light was designed only to be seen and was totally useless for illuminating the path in front. She had to rely on the moon and my light. She did this for the next five kilometres until we happened across the sleeping hamlet of Landow. We nestled ourselves behind a farmer’s barn, threw our ground-sheet across the evening dew, made a cuppa tea and ate some delicious pastries we had been carrying for the last thirty kilometres. We spent the next wee bit watching stars and satellites, talking through the day and generally being glad we were still together. This day and evening I travelled 94.14 kilometres and Sharon probably clicked over around 85. Though the day had many adventures which threatened to ruin it, we chalked it up as a good day. We pitched the tent for our final night on peaceful Rügen Island and contentedly drifted off to sleep. Kia ora. 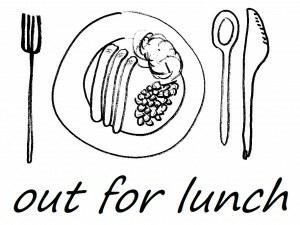 Welcome to 'out for lunch'. Any information on this blog does not necessarily represent any organisations that I am affiliated or associated with. Also the links and their contents posted on this blog do not necessarily reflect my personal views. 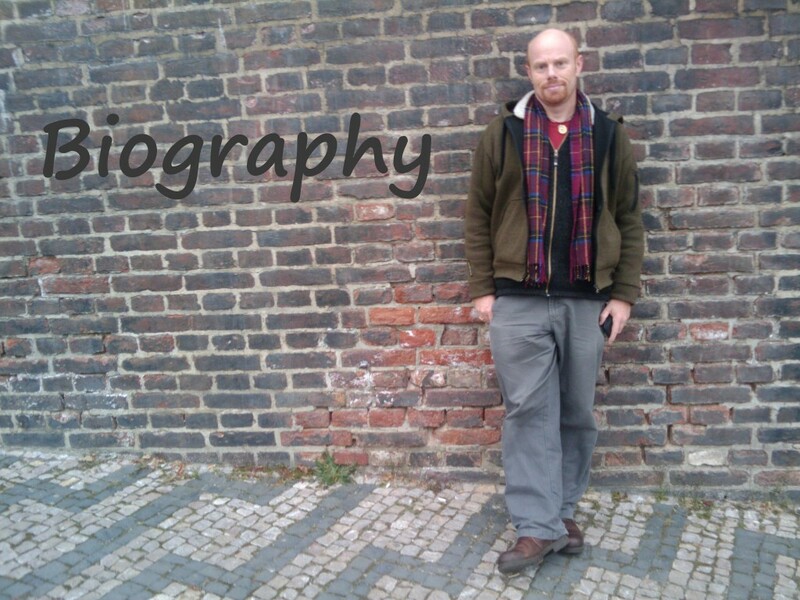 If you have been reading and enjoying my blog, then maybe you would like to consider donating some money towards the creating of it and to my other artistic endeavours. Any gifts would be greatly appreciated.